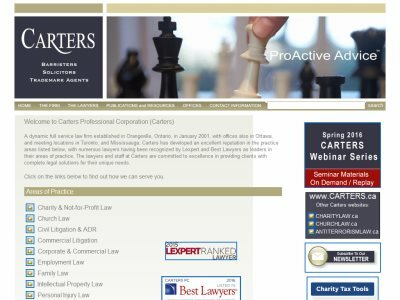 Carters Professional Corporation is a law firm in Orangeville, Ontario. With offices also in Ottawa, and meeting locations in Toronto, and Mississauga. Founded in 2001. Practice Areas: Charity & Not-for-Profit Law, Church Law, Civil Litigation & ADR, Commercial Litigation, Corporate & Commercial Law, Employment Law, Family Law, Intellectual Property Law, Personal Injury Law, Privacy Law, Real Estate Law, Wills & Estate Administration, Anti-Terrorism Law.